When you combine a compound like water with intense heat, said water evaporates. No mystery there. But when you throw extreme pressure into the mix, something funny happens. The compound can actually achieve what is called a "supercritical" fluid state, taking on properties of liquid and gas alike. Now, astronomers at MIT have revealed that exoplanet 55 Cancri e — once thought to be a dry, rocky world — may be literally oozing with supercritical fluids. The discovery is a strange one, to be sure. Supercritical fluids, which are commonly described as "liquid-like gasses" are pretty wacky, and posses some totally bizarre properties (there is, for example, no surface tension in a supercritical fluid... yeah, wrap your head around that, why don't you). But this drastic revision in our understanding of the planet's surface characteristics also calls attention the incredibly mysterious nature of exoplanets in general. 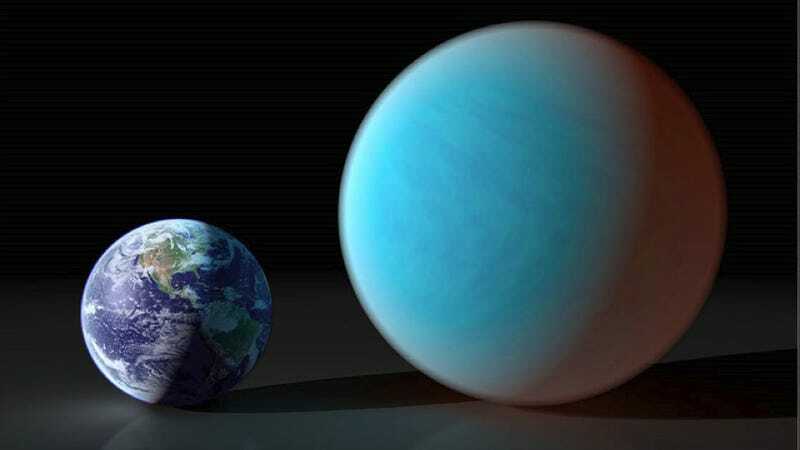 55 Cancri e (an artist's rendition is pictured up top, situated beside Earth) is an old-school exoplanetary discovery; identified all the way back in 2004, 55 Cancri e belongs to the relatively small collection of extrasolar planets discovered prior to the planet-hunting days of NASA's highly productive Kepler telescope. That means we've had more time than usual to get familiar with it. And we've learned quite a bit over the course of eight years. Since its initial discovery, several characteristics of the Neptune-Mass planet have come under revision. Its orbital period, for example (the time it takes to make one trip around its star) was changed from 2.8 days to less than 18 hours. Once thought to be the densest known planet in the galaxy, another team of astronomers soon showed that this was not the case. Now, using data from NASA's Spitzer space telescope, atmospheric scientist Brice-Olivier Demory and his colleagues at MIT may have the proof they need (their findings are still in the peer-review stage) for one of the most mysterious revisions to date; "[The team's] observations," writes NASA's Tony Phillips, "suggest that 55 Cancri e may be wetter and weirder than anyone imagined." With newly identified exoplanets tallying up faster than ever before, there's no telling what strange, wonderful worlds await our discovery (and rediscovery) here in our galaxy.